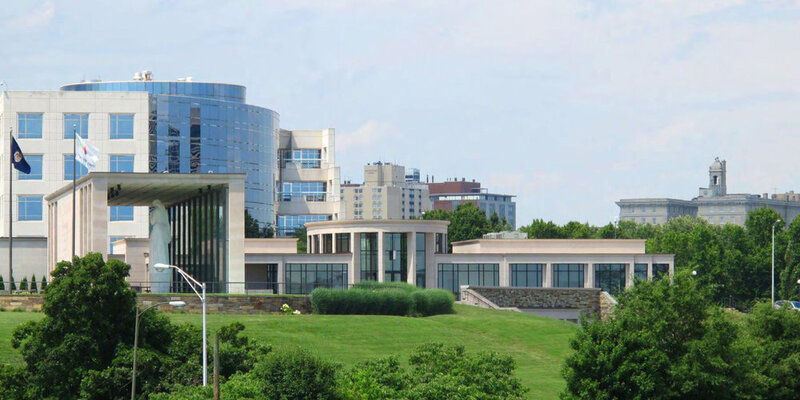 The Virginia War Memorial has planned a third phase to the existing War Memorial campus to accommodate office suites, gallery, education, and memorial spaces. The new structure will be two stories aligning with the floor levels of the existing building, and occupy approximately 19,500 new square feet split nearly equally between floors. Two full levels and one partial level of parking of up to 200 spaces are proposed for a below ground cast in place concrete parking structure. Most of the new building will have a roof and parapet aligning with the existing building, and be clad primarily in stone and glass in keeping with the material context of the site. The southern portion of the new building will be a new Shrine of Memory for the Global War on Terror that will achieve architectural parity with the original Shrine of Memory memorial pavilion. Its height, width, and column bay spacing will match, and its materials will extend the monumental and austere nature of the memorial context. Each level of the building will connect with outdoor spaces, terraces, and landscaping designed to connect seamlessly with existing outdoor spaces. A Memorial Rose Garden has been positioned at the east end of the building between the parking deck and the south ground level terrace. This rose garden will occupy the foreground of one’s view from the Shrine of Memory looking towards downtown Richmond, and provide an accessible pedestrian link between the parking deck and existing amphitheater and lower level terrace. For the proposed north facade, we sought to make the new entrance contrast with the existing oval entrance so as not to compete with it, but at the same time have a dignified and monumental presence when one approaches it from the outside. As such, we’ve envisioned a polished bronze panel canopy that extends out from a limestone entry portico. The bronze panel extends through the glass into the vestibule and then the stone walls start there and continue all the way through to the south end. The use of bronze there is a visual reference to the bronze curtain wall detailing that will appear in the new Shrine of Memory. The design for the new expansion aims to convey significant monumentality, quietness, reverence, and timelessness.